My hubby is the star in a musical in a local theater near Orlando. I was lucky enough to be able to attend one of the dress rehearsals and take pictures. The theme this week at I heart faces is costumes, so I thought that this would definitely qualify. I gave it a sort of sepia tone to give it a rugged and old feel. What a neat photo! I love cowboys!!! Great shot! Wow. Your husband looks like a perfect cowboy! How great : ) Love your entry! Are you going to dress up this year? 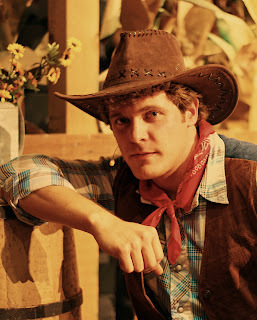 He looks quite natural in that costume...are you sure he isn't a real cowboy??? Beautiful photo! Very good photo. Well done. Great photo! I was blog hopping, and found your blog! I am in Orlando too, Casselberry, and just bought a DSLR and am learning, it isn't easy! I need to take a class. I do photos of my kid, and macro/food. Oh, I like this one...b/c it's not overly Halloween-ish. GOOD pick for this category! This looks totally authentic. Great idea for an entry this week! He makes a great cowboy!! Great pic! It does look like a vintage photo! Great work. I like it, great shot. Got yourself one handsome cowboy! Great photo.